We will start handing out something new this year during the month of December. This year the kids will receive the parts to an Advent Chain each week. On each “link” of the chain there is a small task along with some scripture. The kids should be doing the task that day and then at night you and the kids sit down and read the verse of the day. It is a time of celebration of the birth of Christ! 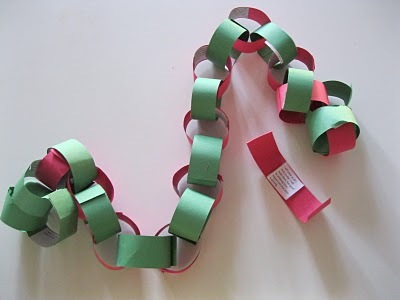 Each day you simply loop the link and either tape, glue, staple, or connect it in some fashion to make it into a chain. Then you can either hang it on your tree or make it into a decoration for your kids to remember the true meaning of Christmas! If you are interested in doing a full Advent celebration with your family, check out the Focus on the Family link here. This entry was posted in Kids, Special Events, Uncategorized and tagged Advent Chain, Christmas 2013, Family Devotion by MV 4:12 Ministries. Bookmark the permalink.